Better than breakfast in bed. The traditional choice for breakfast or brunch, a ham sandwich or even bread pudding. Our flaky croissant dough wrapped around chocolate pieces – simple, slightly sweet, and a hit with the kids. 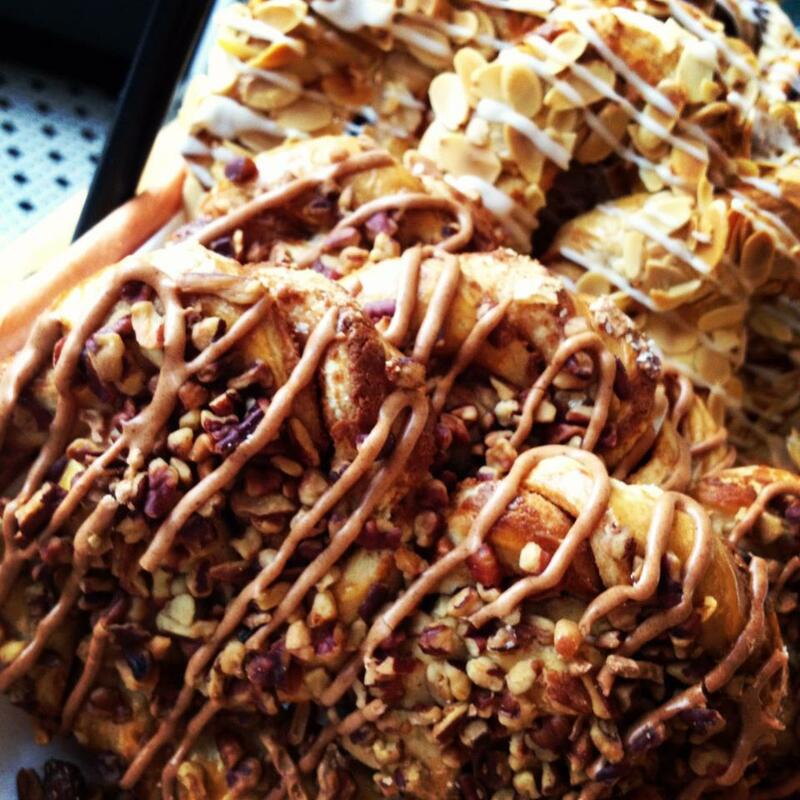 A butter croissant split and soaked with a kirsch syrup, slathered with almond cream, and encrusted with sliced almonds. Flaky croissant dough folded around our vanilla cream cheese filling and dusted with powdered sugar. The classic, packed with large raisins and topped with cream cheese icing. These change seasonally – some of our offerings include apple-crumb, Cherry, and vanilla blackberry peach. We offer 2 varieties daily. Our croissant dough folded around bacon and swiss cheese. Fantastic to eat cold or warmed in the oven. Croissant dough filled with cherry and cream cheese filling. A Parisian standard – vanilla pastry cream and rum-soaked raisins rolled into our croissant dough. Cinnamon-filled and caramel-covered, many of our customers buy dozens of these for family and office events. We layer our puff pastry with an almond filling, twist it up and shape it into a pretzel. Topped with sliced almonds and icing. Just like the almond version, this one gets layered with a chocolate filling and drizzled with icing. This features layers of light pastry, sweet cinnamon filling and a handful of pecans on top. It’s a Turtle Bread classic. In the summer we fill these with blueberries and cinnamon, and in the winter we fill them with apples. Encrusted with sparkly sugar. Puff dough filled with cherry filling. Simple twists filled with vanilla pastry cream and dusted with powdered sugar, they’re great for mid-morning coffee.